The Jewish concept of Messiah was not rich enough in associations for non-Jews to power a Gentile religion. The word was retained in translation, but it needed and received a new mythical content. Jesus gained universal significance as the hero of a salvation myth at the expense of losing his Jewishness. But the cosmic struggle envisaged by the myth needed to be embodied in the details of the story. If the divine Christ defeated cosmic enemies, the human Jesus must have had to face human enemies. Of course, he did, in the shape of the Romans. Why did the mythicized version of his story not cast the Romans as his primary enemies? A precritical or fundamentalist Christian might reply that historically it was in fact the Jews who encompassed his death because his religious claims challenged theirs. We have seen good reason to disbelieve this explanation. The New Testament naturally does not draw aside the veil behind which the transformation of history was effected, and we have to speculate on the motives of those who managed it. As we have seen, the most likely explanation is connected with the movement of Christianity out of Judaism into the Roman world. On the one hand, the new movement was rejected by Jews, so that it must have seemed natural to think that the Jews had rejected Jesus beforehand. On the other, the Church needed to make its way in a Roman world where the Jews were less popular than they had been in the past and would later be again. Deliberately or not, they began to tell the story in such a way that the Romans would look better and the Jews look worse. Now the human embodiment of the cosmic struggle between Christ and the forces of evil becomes Jesus on trial before the Sanhedrin, driven to his death by Jewish blood-lust and fanaticism against the ineffectual resistance of half admiring Rome. Now the Jews have become the enemies of Christ and finally the Christkillers. In late strata of the New Testament, the charge became explicit. ← Are Jews not living up to your expectations? The stories of the trial of Jesus by the Sanhedrin found in the gospels are simply and unquestionably false, and this fact becomes quite clear for anyone who spends a few minutes learning how it actually worked. We find the court procedures for capital cases in the Mishna, Sanhedrin 4:1. The Mishna was the writing down of the laws that had been in effect up to the time of destruction of the Temple in 70 CE. Upon the destruction, the rabbis were afraid that the laws and procedures, which everyone knew and passed down from generation to generation but were unwritten, would be lost. The Mishna was written down and put in final form during the one hundred years subsequent to the destruction, so the information was fresh and accurate. Comment: No defense was provided and the trial commenced with accusations. This was Roman procedure. Comment: This is not a capital offence, it was simply seen as a delusional statement without credibility. Thus, it was ignored and the High Priest went on to the next question. Comment: (a) A person cannot testify against himself in a capital case. The death penalty required two credible witnesses. (b) Jesus’ statement, if this is what he actually said (which is also false), was not blasphemy. Blasphemy is specifically defined as uttering the name of God (YHWH), which was prohibited. Thus you see that blasphemy, and the rending of clothing in response, applies only to the utterance of the Name. Again, you can see that the accusation is made up. Comment: (a) For all to say this was clearly against the law and the Sanhedrin would never have done it. (b) Crucifixion was not allowed for carrying out the death penalty. It would have been death by stoning. This is yet another clear fabrication, written by the pen of a Roman author. Gospels: The synoptic gospels are very clear that the Sanhedrin convened on Passover. Comment: The reason the rule was not to convene a criminal case on Friday or the day before a holiday was because conviction could only occur a day later, and that was prohibited on the Sabbath or a holiday. Therefore, the Sanhedrin would NEVER have convened on Passover. They could simply have had Jesus arrested and held until after the holiday for trial. The entire story of how the trial occurred is clearly fabricated. Jim, couldn’t someone say that at the time (till the destruction) the Sadducees had the upper hand and had a different tradition than the Pharisaical Mishna which you cite? Also, one could say that the Sanhedrin was corrupted by Rome and the [known to be] colluding Sadducees. And that how many Pharisees were on the Sanhedrin anyway? Also, perhaps the laws we see in the Mishna were not the laws that governed Sanhedrin trials around the time of Jesus’ ‘trial’. Perhaps they were a hybrid Sadduciacal/Roman law, with a little input from a still developing Pharisaical tradition (I would say that Mishna law wasn’t fully formed till somewhere late in the 2nd century. The short answer to your question is “no”. The Sadducees were the priestly class who claimed lineage back to Zadok, and for the most part ran the Temple up to the Maccabean Revolt and the Hasmonian Dynasty. Apparently, the ones with the most integrity, including the high priest at that time, are the ones who left Jerusalem and formed the Essene community at Qumran. By the time of Jesus, the Hasmonians were out and the Roman ruler Herod was firmly in control, including in control of the Temple administration. Herod placed his puppets in positions of authority in the Temple and the administration of government. So yes, they were Hellenized and corrupt, but it was Herod who called the shots until his death around 4 BCE. Herod’s descendants ruled after that and disastrously. The response was a national uprising and revolt, which Titus put down with the Destruction. So, the entire administration of the Temple was a complete mess after the Maccabean Revolt. However, the enforcement of local laws was left to the locals, in typical Roman style. Capital punishment, however, remained the prerogative of Rome, and could not be carried out by the Sanhedrin. However, criminal trials could proceed and if the death penalty was required, they would appeal to the Roman tetrarch. The civil and criminal court was a 23-member panel of judges made up of both Pharisees and Sadducees. It was apparently the “lower” Sanhedrin, as there was also the Great Sanhedrin with something like 71 judges, which had jurisdiction over laws and Temple procedures. The Mishnah was developed out of the Midrash Halakhah, which was a collection of writings of previously-existing laws that were in use — obviously, based on the Torah. Even prior to the Destruction in 70 CE, a number of rabbinical schools had compiled their own Mishnahot. The Mishnah and Talmud handed down to us today came from Rabbi Akiva, who lived from about 40 CE to around 135 CE. The Mishnah was not completed until later, as you said, but the work after the Destruction was largely redaction, not the development of new law. So the rules of the court which I quoted above were already established long before Jesus’ time. They are the written record of how court proceedings went at the time. FYI, a fairly good source of information is the Jewish Encyclopedia. There’s free access online. It’s from 1906, so the free edition hasn’t been updated with new discoveries that have been uncovered since publication, but there is a ton of history that was already well known by then and documented. I thought thought Midrash Halakha was rabbinical (as it says in Wikipedia), and that the Sadducees were not rabbinical. You seem to imply that the Sadducees and the Pharisees would have shared a pre-MIshnaic legal code in non-death penalty cases brought before them, let’s say around the time of a Jesus trial (30 AD). I thought the Sadducees had their legal traditions and the Pharisees had theirs around this time. Really interesting Jim. I thought the same thing than Leonard, that because the High Priest was a Sadducee, he did not follow the oral law. So could he be part of the Sanhedrin? I saw this on Wikipedia “Before 191 BC the High Priest acted as the ex officio head of the Sanhedrin, but in 191 BC, when the Sanhedrin lost confidence in the High Priest, the office of Nasi was created.” Thus, the High Priest would not have judge Jesus in the first place, but a Nasi? Isn’t it? I’m really swamped until Sunday, so if anyone else wants to jump in, they’re welcome. But very quickly, Sadducees and Pharisees sat as judges in the court and heard both civil and criminal cases. Processes were different for each type of cases, with a higher bar for criminal conviction vs civil. While the Sadducees were not necessarily law makers, they had to follow the law (of course), and follow court process when they sat as judges. Secondly, we need to be very cautious at every turn (i.e., with every verse) when assuming that what we read in gospel accounts is historical. It may be that almost nothing is true, or that what has a historical bases was distorted. Was the high priest really at his trial? Christians would certainly think so — how could someone as important as their messiah not deserve a huge trial with all the movers and shakers of Jerusalem in attendance? We don’t really know. Leonard, each sect of the second temple period had their set of teaditional explanations for the proper interpretation and implementation of scripture and law, even the early Christians. This is what is today called Oral Torah. We know from the Dead Sea scrolls, that the sect responsible for writing them had their own “midrash Halacha.” Read the scroll 4qmmt. Even the Samaritans have a traditional reading and literature for how to apply biblical laws. The Torah as a written text as we have it today is simply too vague in places to constitute a truly functioning legal system. The Torah says to do certain things that are not adequately explained. The book assumes supplementary materials. The argument in the second temple period was not whether oral traditions existed, but what the extent of these materials authority was, who held the authority to apply them, etc. Also, the argument over whether these explanations should be written down was quite strong. If you need a Christian corollary to midrash Halacha as an example, consider canon law, the didache, the “doctrine of the twelve apostles” etc. Give this book a read. Let’s say it’s 30AD (or any time before or after the taking away of the death penalty jurisdiction), and there is a Sanhedrin trial, and it is stocked half with Pharisees and half with Sadducees. Which oral law was used? The Pharisees oral law; the Sadducees, or some compromise (either forced on them by Rome or agreed to by the two parties). I have trouble getting how they worked things out, since I read that they occasionally slaughtered each other (or maybe that was only during Hasmonean times). In America, you have two sides at odds with each other on the Supreme Court, but they both follow one law. They would likely work things out just as court justices do today in their cases. How many people on the Supreme Court in the U.S. Actually agree 100% of the time? People can have fundamentally different opinions/approaches and work together. My guess is, Halacha went according to the majority opinion at the time. The Pharisees had more public support, so I would bet they one lots of arguments over what should be done. In the time of Jesus, the Sadducees had the influence with Roman backing. Ω Who killed Uriah the Hittite? Ω Just as David killed Uriah the Hittite by the hand of Ammonites, so the Jewish Court killed Yeshua by the hands of the Romans. Kavi, now I have a question for you: did Jews conspire to poison all of the Gentile wells in Europe during the Bubonic plague? Kavi, we don’t know what really happened. It’s quite possible that there wasn’t even a trial; that the Romans acted on their own and crucified him for being a trouble maker. Think overturning tables and creating a big scene in the temple. The Romans tolerated no such outbursts during Pesach, the holiday that celebrates freedom from oppression, when tens of thousands of Jews pressed into Jerusalem, and the risk of outright rebellion was incredibly high. Many more Jews were crucified for far less. Also notice that the Gospel of John has no report of Jesus being tried by the Sanhedrin, only being taken to Caiaphas. This is probably because the writings of the author of this Gospel reflect a better understanding of Jewish practice than the other writers, and he undoubtedly knew there would never have been a convening of the court on holidays — just as I explained earlier. Johns Gospel creates more problems than it solves for the Christian narrative. What should concern everyone [Jews, Gentiles, and Gentile Mashiachim] is that people like Nicholls and Telushkin lie If and When they say the B’rit HaChadashah supports past and current persecutions and murders of Jews. For those who know the writings, it takes almost zero effort to prove that a truthful rendering of the New Covenant will never justify any persecution and/or murder of Jews– and, honestly, isn’t that what we all want? 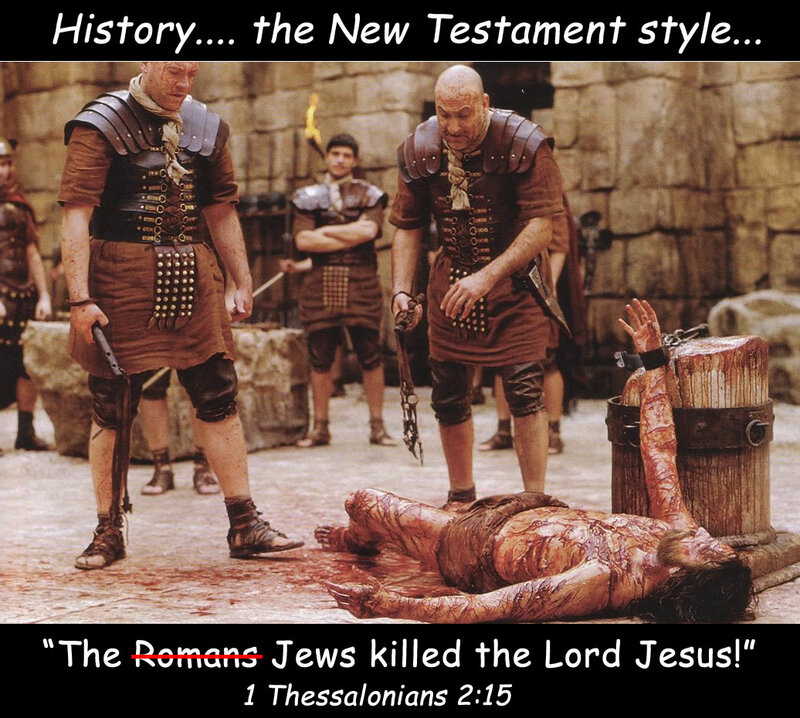 When someone reads Yeshua’s statement, where is there any room for hate or vengeance? You are cherry picking statements, Kavi. You have to read NT as a whole and then look at the fruit it wrought when it comes to treatment of Jews at the hands of Christians. There’s plenty of the anti-Jewish hatred on the part of the church scribes who penned and edited the NT; it permeates the NT, especially the later books. It’s the same sort of hatred mixed with the supposed “concern” for the “poor unbelieving Jews”, the same sort of “caring” that one sees later in Luther, who advocated “severe mercy” on Jews “for their own good” (see his work On Jews and their Lies). In other word, a “good Jew” according to the NT and most later Christians is a Jesus-worshiping Jew. We can judge the tree by its fruit, as Jesus supposedly said himself. The New Testament promises in many places weeping , death, suffering, and gnashing of teeth for those people who understand Christian Faith improperly. All you need to read is a history of Christian sectarianism. Various people and groups have claimed to represent the “true Church,” and using this claim and Christian texts, have killed thousands. Did these people live up to Jesus’ ethics? Clearly not. However, that’s not the most important question to ask. The real important question to ask is whether these groups have had verses in the NT text from which to draw inspiration in order to encourage their violence against groups with whom they disagreed? If we ask this question, it’s clearly a resounding yes every time. You Kavi may have a great progressive interpretation of the New Testament text personally, it may be good, but that’s an irrelevant point because of the NT verses which can be construed (and historically have been construed) as promoting and allowing violence against many people, such as the verse in Luke. Gnostics, Arians, proponents of Monophysitism, monarchists, etc. were all killed “justly” at some point by different Churches using the same NT books, verses, and themes for justification of their actions as “true followers.” This is just me talking about violence among Christian groups themselves, not even counting what Christians did to polytheists and Jews. We may claim that these violent people and groups weren’t representative of the “true” followers of Jesus, but they were still reading and using verses from the same authorized books as the true Christians. It’s unimportant to a degree what the intent of the original author was, if the ultimate impact of his words leads to grave injustice for so many people. To illustrate my point. If we had only had one true Christian in the world, who read the NT perfectly, but we had 8 billion wicked Christians who read it wrongly, the world would do better not to have such text as a moral example. I glanced at the Jewish Encyclopedia and a few other things, and the one thing that stands out is that ‘they’ say that the difference between the Pharisees and the Saducees was that the former had an oral law whereas the latter just went by the Tora. So I have in my imagination one half of the Sanhedrin looking to their Oral Law (halakha), and the other half looking into the Tora (the mitsvot) to decide anything. I find this (Saducees only looking to the Tora/mitsvot) ridiculous, but that’s what the sites I glanced at say (just google images of ‘differences between Saducees and Pharisees’). I also would like to know why you call the oral laws of the various sects ‘midrash halakha’? I would think they would be called “the halakha of the Sadducees” (do we have any evidence of a Sad. halakha/oral law?) ; “the halakha of the Pharisees”; “the halakha of the Essenes” (any evidence that they had a halakha/oral law), etc.- (i.e. without using the term ‘midrash’). Leonard, this is a really great question. I don’t have a complete answer for you right now but its worthy of doing some research and reading a few books. What I can tell you however is that the Sadducees adhered to all the laws of Torah as they were practiced at that time. They weren’t rogue or living by a set of laws that applied to everyone else except themselves. They had to keep kosher, keep Shabbat, not murder or steal, etc., etc., just like the rest. The imagined split in this regard may stem from the fact that the Sadducees were not in the mainstream. All the Levitical laws — and there are many — were practiced only by the Kohanim and Levites. The bulk of the population, “Israel” as referenced in the commandments, lived everyday life. The priestly class was busy full time with all of the rituals surrounding the Temple. And they married within their “house” and their kids were taught the curriculum of their professions. So there was a noticeable separation between the priestly class and the rest. But they not only followed the general laws, they followed the Levitical laws in precise detail. Read Leviticus and you will see that the commandments there are generally more detailed than in the rest of Torah. Therefore, the Sadducees followed more of the written law than the rest. Those who determined to write up and codify the missing detail and gaps in the common law became known as Pharisees. Part of their motivation was apparently also to empower the common people so that they weren’t taken advantage of by the ruling class. It makes me think, all messianic want a “Jewish unbelieving friend”. Do they go and help for the fact of helping or for the fact of “showing Jesus love to win some for Jesus”. I thought love has no motive? No Faith should be judged by its abusers. It does not matter whether one holds to Islam, Christianity, Roman Catholicism, Rabbinic Judaism, Buddhism, Mormonism, Hinduism, etc– each Faith has individuals who will twist texts to mean whatever they wish it to mean. Mr. Nicholls is one of those who purposely decided to be historically and theologically inaccurate in order to sell books and pad his pocket– however, it takes only a scant few minutes to debunk the falsehoods he perpetuates. And, like I tried to say– isn’t it better for ALL of us to expose these shenanigans REGARDLESS OF YOUR FAITH in order teach current and future generations that discrimination and hate and murder is wrong? Wouldn’t our world be a better place to live? Remi I don’t advocate Jews believe in Jesus, but most Christians care more about a tacit acceptance of Jesus then they do for people living like he did. You’re very right Kavi, but in the case of the Christian Faith, the “abusers” are the theologians and codifiers, the supposed great saints, authors of Christian liturgy, and theological treatises etc. not a minority faction within Christendom by any stretch. Was Chrysostom an abuser? Was Augustine? Justin Martyr? Luther? Calvin? All of these Christians are pillars of various different Christian communities and their writings are so full of abusive language, lessons on how to persecute, etc. as to be obvious. The argument between Sadducees and Pharisees was about who had the authority, priests or laypeople (Pharisees) all Jewish groups have traditions of how to read scripture. To the Mashiachim, no man or woman should ever be elevated to be a pillar of anything. Instead, we are supposed to remember that we are mere stones built upon the chief cornerstone, Yeshua ha Mashiach. As such, it does not matter what people said or did in the past– our job in the present is to fight against any type of evil words or deeds which idolize hate and murder. — Imams who denounce Islamic terrorism. I am sure everyone would agree it is imperative we lay aside our differences and work together so this evil does not triumph. Kavi, Jesus is a [long dead] man, and yet he’s a pillar you elevated above G-d Himself. The irony of this fact is lost on you, unfortunately, because you have accepted idolatry into your heart. L’shanah tova, all — a good and sweet year to you. In answer to your question, have you read the Dabru Emet [ דברו אמת ]? Signed primarily by a few liberal interfaith American Jews from the Reform and Conservative movements, rejected by most of their fellow liberal Jews and by virtually all of the Orthodox rabbis. NO, WE DO NOT. You worship a mockery, a triune G-d, with Jesus as your idol. NO, WE DO NOT. Christians seek authority in their own translations of the Tanakh, but their primary authority is the New Testament. “Can”? NO, most Christians do not respect this claim, only American Evangelicals do, a small fraction of the total. Jewish morality includes rejection of idolatry, which Christianity upholds in their worship of Jesus. Nazi Jew-hatred is a direct descendant of European Christian antisemitism. When G-d settles things, there will be no Christianity on this earth. It will go the way of all idolatry. Targeting assimilated Jews for conversion will further weaken those Jews and remove them from Jewish people. The Bible warns Jews not to create bonds of unity with idolaters. Jews will not acknowledge legitimacy of Christianity or any other man-made religion. Working together on justice and peace TODAY can cross religions and ideologies, but in the end true justice and peace will be achieved only when Judaism is the sole religion on this planet. Hi Kavi, I have not read that דברו אמת. Reading Gene’s comment, I would say that I agree with what he said and answered well on all your comments. Anybody can work with anybody as long as they don’t bring their gods in the picture. We should work with other to improve the world. But when it come to christian, they have their secret agenda, “Do good to others that they me see your good deeds and convert you to Christianity.” And any evening, you would pray for Jesus to open doors to share your messiah. So, in the end, we should work together, but you should stop trying to convert us… Maybe that’s what we should do, agree to share in community work, but you would have to sign a waiver stating that you would try to convert us (AKA not share your faith). But real christian would never agree with that, because their objective and end purpose is to share their faith. So in the end, better work each on our own and not trying any interfaith relationship. However, isn’t the Dabru Emet written by Jews? Perhaps it would be useful to understand what you [and others] think who a Jew is? Kavi, a more useful thing would be to know what sort of a Jew has the right to issue binding legal “Jewish” opinions on how other Jews are to view or to deal with things regarding Judaism, Torah and especially idolaters. In my view (and that of many other Jews), only those Jewish leaders who observe the Torah AND have the proper Jewish education (e.g. not one received at some “college”) have that right, which excludes those who are Jews only by ethnicity, those who do faithfully not observe Jewish laws themselves, and those who do not believe in divine origin of the Torah and its ongoing validity. The pope is a christian Kavi, maybe you should listen to him and bow down (sorry-pay homage) to Mary, and the 2000 saints, just because he is Christian. Maybe it would be helpful for you to tell us what is required to be considered a follower of the WAY? What is a christian Kavi? Remi.. that’s a really great point. While Kavi denies a “true Christian” status to most Christians who don’t think like him, he expects observant Jews and G-d-fearing former Christians to accept opinions of anyone who calls themselves “Jewish” and then acts surprised when we don’t. Hey Jim, I had a discussion with my wife about the trumpet of Rosh Hashanah. She said it is a waning sign for judgement (Because Yom Kipur comes the week after and judgement is coming). Now I told her that there is no explanation in the bile why G-d is asking to blow trumpet. Is there any explanation. I check a concordance and all the instances of blowing the shofar are related to Joy till Jeremiah. Is there anything else that would explain why we blow the trumpet in the Tanakh? I answered that if Jesus really rose from the dead, then the new testament would be inspired, but I answered that the way we can see if he really rose from the dead is only if he fulfilled prophecies from the Tanakh. What would you answer to that question? It came to my mind afterwards the false prophet of Deuteronomy. If Jesus would have risen from the dead, would that necessary mean that the New testament would be inspired? Thanks Gene. That’s what I thought and that’s what I should have answered. Someone told me again Ezekiel 16:63 as prove that Jesus is the new covenant. Because it uses the word “sacrifice” in Hebrew. I answered that the “sister” (Israel I supposed) has not been regathered yet and that also the fact that it say “sacrifice” does not mean it is Jesus, because that would have been an unacceptable sacrifice according to the law. But of course, my christian friend threw Isaiah 53, but it’s useless to argue with that one even if Isaiah 53:1 is obviously the nation speaking (I know, PAUL does not agree with me and as per any christian, Paul is right even if he’s wrong). Anyway, what would you answer to someone who throw Ezekiel16:63 at you? Responding to Ezekiel 16:63 goes back to the fact that atonement is not limited to “blood sacrifice.” Never forget this! This is the key to destroying the foundation of the NT, as it is based upon the faulty premise that the ONLY WAY to atone for sin is through blood sacrifice. This is patently false, as the prophet Daniel is called RIGHTEOUS in Ezekiel 14:14, yet he had no sacrifices to make! He lived during a time of exile, yet he is called RIGHTEOUS…Just like ABRAHAM! But what about Daniel’s righteousness? Daniel didn’t have a Temple to do sacrifices in! And most importantly, he didn’t have any “jesus blood” shed on his behalf! The 70 year exile is a thorn in the christian’s side! The fatal flaw of the NT is when it makes the statement that “Without the shedding of blood, there is no forgiveness of sin.” Hebrews 9:22 states this verbatim, and it is patently false! Yet this is the entire foundation of the NT’s position on how jesus is supposedly needed for salvation. So there’s your answer Remi. Atonement is not limited to blood sacrifice. The next time a yoshke believer tries to pull that on you, I suggest you go this route. Thanks Yehuda, really useful. I hate circular reasoning. How do you know Jesus was the messiah? Because he fulfilled Ezekiel 16:63 by being the sacrifice that remove sins. How do you know that Jesus is “the” sacrifice that removes sins? Because he is the messiah. How do you know he is the messiah? No it’s not circular reasoning, you have scales in your eyes Remi! Hi, I had a discussion with my wife about the “trinity”. I think it is quite clear, that according to the Tanakh, that it is a false doctrine. I would say that it is quite clear, according to the new testament, that it is a false doctrine. Nevertheless, so many won’t change their mind, because the other options are not better. Then, those like Kavi that say “Jesus as the Memrah, or he is Divine. And you can just trow in their face,… That’s polytheism! The Father is god, Jesus is divine / the word / the son of god / other alternative that cannot be explained, but require you to bow to Jesus equals two gods. So why they don’t change their mind? I think I have part of the answer. Keep the old testament without the new, and you are still stuck with the fact that with one sin, you deserve hell, and a just god will not forgive any sin without a substitute. If you have the whole Tanakh, but look at it with the eyes of the new testament (+ Hours and hours of Preachings at your church), then you can only find despair. My wife told me that I overlook / skip so many things that my belief cannot be right. Yes I agree that if you only remove Jesus, but keep all the beliefs of the new testament, I am in big trouble, but that’s not the case. G-d will not judge you if you “fall short of the Glory of G-d”. G-d made it plain clear that HE is not like men who have a hard time to forgive! “Yet you say, ‘The way of the Lord is not just.’ Hear, you Israelites: Is my way unjust? Is it not your ways that are unjust? How many times I heard “G-d is a Just Judge and will punish all sins. If you sinned once, there is no hope for you, that is except Jesus”. But that’s a LIE, G-d’s way are higher than us, but if you have been thought all your life that lie, then you are stuck with a polytheistic god (Jesus + Fater + HS = 3). So you will not go to the One true G-d for fear that he will not forgive you and throw you in Hell, because that’s what you have been taught all your life. Jesus is the Memrah or divine, is just another way to hide the fact that you worship two deities! “Yet you say, ‘The way of the Lord is not just (BECAUSE G-d WILL FORGIVE YOU).’ Hear, you Israelites: Is my way unjust? Is it not your ways that are unjust? EZEKIEL 18, PSALM 32, PSALM 51, PSALM 103, Isaiah 1, Daniel 9:9, Micah 7:18, Isaiah 55 and many other passages say that G-d is ready to forgive anybody that come to HIM, and Christians like Kavi use it to point to Jesus. G-d Can forgive your sins. Only when you see it through the new testament lenses, you see the father as been a mean and unloving god who will not forgive you. And all those amazing bible verses, you put Jesus in it! Nice quote, Remi. Christianity, and Pauline drivel in particular, is the reason for the common view among non-Jews that the Jewish G-d (G-d in the “Old Testament”) was vengeful against sinners and exacting when it comes to “perfect” execution of commandments. In such a view, the “blessed” Jesus came to soften this harsh attitude that G-d and the Torah had against sinners. Jesus brought “grace”, and if he was the one who brought grace to humanity, it must have lacked in the G-d of the Jews and in Torah. That’s a big obstacle for Christians. Even if they realize the Jesus cannot be G-d, or a trinity, they are still stuck with the New testament lenses and don’t see hope in Judaism. And that’s why so many are discourage to see me denying Jesus, because they think I jumped out of the only safe “rock”, when the truth is, G-d is the one to protect us, not a man. If anyone wants to convince that Jesus is not to be worshipped, he has to work hard to show that G-d is a compassionate G-d and to destroy all the false teachings of the new-testaments. They can read the Tanakh and only see the old testament, the one that condemns them, so they cannot leave their idolatry. It’s no wonder that Marcion (who only accepted Pauline writings – one wonders why? – when he created the first “New Testament”) advocated that Jesus was a much superior god and that the G-d of the Jews was real, but different, harsh, inferior deity (with bloody sacrifices and all sorts of laws that alienated Jews from Gentiles) who had little relation to the merciful and spiritual Jesus of Christianity. Marcion’s ideas were VERY popular among early Christians, to the point that Christianity almost became based on his teachings. Interesting… I think there is a lot of Marcions out there that have been silenced and we do not know too much of them anymore. And because each are elohim (father son and HP) and elohim is plural, that means each gods is more than one, Father = 3, son = 3, spirit = 27,… 33 And we all know that 3 is perfection… 3 and 3 double perfection, just like jesus was 100% man and 100 % god. 2 times 3, you see how right christianity is. PERFECT. I prayed a lot about it… and I rebuke you SATAN in the name of.. . if you deny there are not 33 gods in one. I am still a monotheist! Open Doors that everybody can see that! Sounds familiar. 10 huh? With bodies made of supernal matter? like spiritual angels? hmmm. 3 intellectual sephirot (chokma, Bina, and Daat) and seven emotive attributes of the seven lower remaining sephirot. CR, I knew I was inspired! Remember your Creators (Jesus + Father + HP Sauce) in the days of your youth! In all seriousness, what are your view on mysticism, that is Jewish Mysticism, should it be taken seriously? I have heard of a few preachings, out of curiosity, but I am not really familiar with it, what are your thoughts. My thoughts are Remi that exactly this type of mystical speculation is what lead directly to Christian views of J.C, to Chabad’s Menachem Medel S, that it inspires your Nachman followers, etc. Gene, you may (at a glance) be correct that there are apples and oranges here, but here is the point. WE KNOW FOR A FACT that Jesus’ early followers were fully Torah observant, just like the followers in Chabad, in breslov, etc. The point is, these messianic theologies don’t come out of thin air, they roots. They have to come from somewhere, and at a certain point, you can’t blame non Jewish polytheism, especially in modern cases like Chabad. The presence of Elisha Ben Abuyah in the Talmud and his “two powers,” and the warnings in rabbinic literature not to invoke Michael or Gabriel show that these theologies were known well enough that they required a response from the sages. Kabbalah seems to come out of Neoplatonism. If this is true, should Jews be following it? Much of the philosophical understanding of doctrine in Christianity, Judaism, and also in Islam has Platonic and Aristotelian underpinnings, as these were some pillars of the intellectual climate of the ancient world, the way modern science is today. CR, I get that you’re railing against hypocrisy, as you should. But there is a fundamental difference. The early followers of Jesus may have thought he was the messiah and had been resurrected, as many Lubavitchers do about the Rebbe. But neither group re-wrote the Torah. The Talmud does not directly counter Torah, and even those who put Talmud above Tanakh in their mystical thinking still hold Torah above all. And the Lubavitchers and other similar groups are a minority of Jews, and the vast majority do not subscribe to their views. As a whole, the Jewish people put Torah first (if they regard scripture at all). Christianity, however, has completely abrogated Torah and re-written the Bible. And every single Christian participates in that. So go ahead: call a spade a spade and disdain hypocrisy, but there are a variety of apples, yet an apple is an apple, and an orange is an orange. Remi, regarding the mercy, or perceived lack thereof, of Hashem, I would like to share my personal view. And I apologize that I don’t have time tonight to support this view by citing verses. First of all, there are categories and degrees of sin — clearly demonstrated by the fact that there are different kinds and severities of punishment to fit the crime. It is not at all true that if you break one commandment, it is as if you’ve broken the entire law. That is a declaration of an utter ignoramus. Second, the Torah provides redemption, and in many cases forgiveness, of all sins. The most severe sins are capital crimes and the punishment is death. However, the criminal redeems himself by his own blood. A level down from capital crimes are sins deserving “karet”, or cutting off. Karet refers to the spiritual cutting-off of an individual, but can also be the cutting off from one’s family and nation. The sin of idol worship — if done only personally — falls into this category. However, if a Jew causes others to worship false gods, the punishment is death. Below these are a whole host of sins, and punishment includes paying money damages, public humiliation, or remaining spiritually unclean for certain periods of time and banned from entering the Temple court or even the camp itself. All these punishments are payments for sins, and once the price has been paid, the account is once again zeroed out. now, what confuses all Christians, and most Jews too, is a complete misunderstanding of the role of blood of atonement. First, understand the fundamental concept that when a person sins in Israel, there was a resulting effect on the Tent of Meeting or Temple. It created spiritual pollution, if you will. And, besides the person’s own payment for his sins and forgiveness, the Temple pollution had to also be expiated. You must understand that blood atonement never “washed” sin from people. Among the several types of animal sacrifice, the sin (purification) offering provided blood to be used to expiate accumulated sin from (1) the tent of meeting, (2) the altar, the Holy of Holies / Mercy Seat, and (4) other holy objects. Not people!! This is key. In crime investigation, there is a saying that if you want to find the perpetrator, just “follow the money”. In the same way, if you want to understand blood atonement, then “follow the blood”. Go back and look at how it is used. What is it sprinkled on? Why was it sprinkled on certain objects? To cleanse the sinner from sin? Then why wasn’t it sprinkled on the person, if that was the purpose? Because when the Torah says that the high priest will sprinkle the blood and “atone for you”, it doesn’t mean cleaning sin from the person. It means cleaning the person’s sin pollution from the Holy objects! THAT is why blood, with it’s life force, is applied to the horns of the altar, sprinkled on the ark cover, etc etc. It is used as a spiritual “detergent”. There is only one circumstance in which blood is applied to living flesh, and that is on a person who has been declared clean of leprosy and goes to make a sacrifice. But that is special case because leprosy, or more generally ‘scale disease’, was considered to be like death itself due to the skin, which made the person look like the walking dead. The most spiritually impure influence on the Temple was death, and the tension between life and death is at the foundation of all the priestly laws. Other than that specific application of blood on a person, if you go through all the uses of blood for atonement, starting from Exodus 20-something, through Leviticus into the first part of Numbers, there you will see that blood is never applied to persons — it is applied to holy objects, because it is used to purify those! Blood does not cleanse sin from people. Period! This whole blood mishegas is a fundamental misunderstanding of the writers of the NT. They didn’t get it. Neither does each and every, single Christian. For personal forgiveness, first sin must be paid for. Then sins against persons must be granted by the offended persons. Sins against God must be forgiven by God. And God forgives sins after restitution (payment), sincere regret, the determination not to do it again, all of which is called repentance, a contrite heart, and the asking of forgiveness from God. And He forgives. Postscript: I mistakenly said that becoming impure for a period of time during which a person could not enter the Temple due to contamination was a punishment. That’s incorrect. If you had to stay outside the Temple for 7 days because you came in contact with blood, for example, that is simply the period of time required before becoming ritually pure again. Thanks Jim. That — if true– pretty much puts to bed the whole “[We are] washed in the blood” mantra of Xians (next time I’ll tell them “it (objects) were washed in the blood”). On something unrelated to this Xian misunderstanding, you wrote: “The most spiritually impure influence on the Temple was death,”. My question is, Why / how does death (slaughtering an animal and applying its blood [to objects] in the Temple) atone for ‘death’ (i.e the “spiritually impure influence on the Temple”)? Great question Leonard. The only animal carcasses that convey impurity are those of the non-kosher variety. The variety that were fit for sacrifice did not contaminate. Since the spiritual pollution of the Temple and holy objects can be connected in some way with death, it is the life force within the animal’s blood that has the power to decontaminate. However, a dead human body conveys a very high level of pollution, perhaps the highest. Thus, vigilant efforts were made to prevent a human corpse from being in the court. And anyone who came in contact with a human corpse became highly impure. Numbers 19 describes that special water containing the ashes of a red heifer (red, because that is the color of blood) must be used to decontaminate these persons. Notice that blood is not used. A person who came into direct contact with a corpse had to decontaminate himself with the special water on the 3rd and the 7th days. If he did not, as it says in Num 19:13, he would contaminate the Tent of Meeting and therefore must be cut off from Israel. This verse is a good example of how individual’s impurities contaminate the Temple. The life-death dichotomy could also explain much of other laws of impurity by the way, such as the laws of Niddah, the time of a woman’s period. This blood is significant because not only is it blood, but it’s blood that results from death — human death, no less. Also, many of the laws of Kashrut (Kosher) can be understood in the context of death. Shellfish, for example, feed on dead organisms. Jim, my point isn’t to cause a bother. I know that Pauline Christianity changed things, but Judaism has had one of those antinomian groups too in later history, they were called the Sabbateans. You are right, a minority is just that, but again, Christianity had to have roots somewhere. You are acting like I don’t know the core differences between Judaism and Christianity theologically or practically speaking. Believe me, I do. I realize they have fundamentally different theologies, but it is a vine to fruit relationship. The fruit may be diseased, but there it is. I’ve studied many many different religions, and they all say and do similar things, but have differing justifications for similar behaviors, etc. Functionally speaking a Shinto adherent at the graveside of an ancestor is doing the same actions as a hasid at the grave of a rebbe. (showing respect, meditating on the person’s life, reflecting, etc.) but one act is considered idolatry, while one is not, even though the actions are functionally the same actions. Its the same with Christian like theologies. When you say that someone can speak in G-d’s name as his unique Shaliach, (such as the angel in genesis 31:13) to the point that this angel says “I am G-d,” you have a situation where you have the father, and some other entity, both sharing title and Job description. That is functionally the same as what Christians do, in the context of their theological construct. So, you are right. I am calling a spade a spade. Its uncomfortable, I realize that. Hi CR, it might be a concern to bow to a tomb or a dead man (literally or spiritually). Idolatry is always something wrong, and if they are idolaters, that’s not right. Most Jews, don’t do that thought, and if some are idolaters, then G-d knows who they are. Talking of which,… what do you think of the Mezuzah. “The mezuzah affixed to the doorpost of a home serves as a protection against the messengers of evil.”. Isn’t it a form of idolatry? G-d is the one that protects us. (I don’t think evil spirits are evil as the New testament proclaim, I think bad Spirits are also from the L-rd, I don’t believe in Dualism, but anyway). You may say, “we put the Mezuzah, and because we are obedient to Deut 4, G-d protects us, but is it what most Jews believe anyway? This seems more a concern and widespread practice than worshipping the tomb of a dead Rebbe…. CR, the reason I said that you are comparing apples and oranges, is because you are focusing on some customs or beliefs of one particular Jewish sect (usually hasidic, and even more usually Chabad), or bringing up Kabbalah (which is esoteric mysticism which some Jews ignore and even those who embrace consider “dangerous”, and not some mainstream Jewish theology) and comparing them to the mainstream beliefs of Christianity or mainstream practices within some other religion. It would be similar if I chose to focus on the snake handlers of rural Kentucky and then claim that Christianity is no different than Hindu snake charmers channeling the Nāga snake god. There are elements of Kabbalah and or tons of philosophy in the writings of every major mainstream Jewish theologian Gene. From Rambam, to Ramban, to Saadiah. Its simply a fact that esoteric doctrines are part of every religion. Things like the trinity were technically viewed as esoteric and dangerous too. Any early manual of Christian discipline clearly states that neophytes are not supposed to learn those doctrines until removed from polytheism. In fact, before Protestantism, only the priests really learned anything. All of the caveats you bring up are just that, caveats. “but its different.” “But, we don’t all do it.” If that kind of reasoning flies for Jews and their theology, what about all the other nations, and other religions? Again, CR, even things like Kabbalah with its 10 emanations (which are merely different characteristics of G-d and not some persons) which you are fond of pointing out do not even approach things like the Christian Trinity for example, with its deification of a dead man and all the practical ways this idea translated into Christian practice and doctrines, making the dead man god central to the religion. So, you are bringing up superficial similarities or ideas that are recent to Judaism (e.g. chasidic rebbes) that you find somehow as somehow resembling Christianity as examples that Jews shouldn’t throw stones at Christianity or other religions. Pointing to superficial similarities only works when one is trying to impress the ignorant. Gene, your objection notwithstanding, just look at history. Kabbalistic speculations produced the movements and people like Shabbatai tzvi and Jacob Frank, and later produced what happened with the Rebbe, all your claims of only superficial similarity have disappeared in light of history. There are trinitarians who also have very philosophical views of the trinity. The point is, your superficially similar mysticism has still produced the same real issues and conflicts as the Christian movement. You can explain away these things however you want, it doesn’t matter how superficial the similarity when the same movements emerge. Just think it through logically. Those sephirot may start as allegories for the ten sayings of creation, or of attributes, but very quickly that morphs into more. We know this happens because we’ve seen it happen. A Tzaddik who acts as a Shaliach that acts with G-d’s authority, such as a rebbe (a kosher viewpoint) very quickly morphs into a person who’s will has been so nullified by the will of G-d that he is metaphorically the essence of G-d in a body, because his soul is the reflection of godliness. Metaphor that everyone quickly morphs into weird realities. You can say how truly different kabbalah is, but it doesn’t mitigate the historical facts and occurrences of this type of thing. metaphor that applies to everyone (such as the righteous) quickly and easily morphs into weird realities. No, not at all. I’ll give you a better one. Actually Gene, a much more correct parallel example would be a comparison of mainstream Christianity, and Mormonism. In Mormonism, there are mainstream Christian Orthodox ideas that are quite fundamental in both religions, but in Mormonism they are overly literalized to disastrous effect in the sectarian Mormon group. That’s what I see between Christianity and Judaism. Clear Parallels do exist between the two groups, but the interpretation of what these various teachings mean or imply are very different and lead in opposite diametrically opposed directions. The roots of this mystical messianic speculation that we see can be traced in mainstream sources. Christianity takes all these themes (that in Judaism always apply to the righteous more generally) and apply them only to Jesus. You are right strictly speaking that these ideas have a “proper” interpretation in Judaism, but these ideas are easy enough for people to interpret incorrectly that messianism like Sabbateanism, Breslov, Chabad, etc. (on top of Christianity) have been the result. CR, it’s a little strange to be arguing these points with you, because I know that you know Judaism and Christianity very well. Better than I do. But I feel that, despite your depth of knowledge, there seems to be some kind of disconnect. Perhaps you are simply stating that because mystical messianic beliefs are common to both Judaism and Christianity, Jews do not have the righteous position to be bashing Christian doctrine. And certainly the various mystical beliefs that were circulating within the Jewish community at the time of Jesus created fertile ground for Paul’s construct, which was then built upon and spiritualized further until Jesus became God. But that’s the point. Yes, there is weird and cultish mysticism within certain Jewish groups. And their origin may be exactly the same as what resulted in the belief in Jesus the Messiah. But, no Jewish messiah has been or is worshiped as God Himself. Even though certain Jewish cults may consider their messiah to come from a higher plane or still present spiritually, or will even be resurrected, these spiritual qualities of the revered are more akin to angels’. Messiah, angel, more than human, but not God. Okay, I realize we’re talking about a point on the scale, here. Now it is also true that the Tanakh tells us that Saul sought out a necromancer and raised the spirit of Samuel from the dead. While this is one of the things that Saul did that he was not supposed to do, the Book of Samuel does not deny that the spirits of the dead live in the netherworld. But Deut. 18:11-13 admonishes Jews against seeking out necromancers and trying to communicate with spirits. It doesn’t deny their existence, but forbids turning to them. Seems to me that the group passing by the Rebbe’s seat with their wine cups are violating this commandment. Nevertheless, no one worships the Rebbe as God Himself. Christians worship Jesus as God Himself. I don’t see Christianity as fruit from the vine of Judaism. Paul interpreted the LXX as a Greek would. And as a narcissistic, delusional megalomaniac at that. The gentile world, in whom Paul found an audience, took his teachings further and completely abrogated the Jewish scriptures. They then pummeled the Jewish community into submission and imposed their idolatrous desecration onto everyone else. I see Christianity as a hijack of Judaism. None of the other nations and religions claim to have replaced Judaism, hijacked our scriptures and our God except for Christianity. That’s the problem. Jim, its not that I’m having a disconnect at all. I just realize (from study) that If a person can (in a kosher way) believe that Moshiach exists on “another plane,” that he has a somewhat unique angelic soul that reflects godliness, or that he has a state of prophecy close to the state of Moses’, etc. you are already well near somewhere on the rubric where many primitive Christianities actually sat on theology. There are malachim in Tanakh, human people in Tanakh, and especially places in the Tanakh that are said to bear hashem’s name. (ie its taught his providence rests there.) Angels (who are known by us to be creations) bear G-d’s name in the Torah, and even speak in his name, even in first person as emissaries. A Shaliach is like the one who sent him. While you and Gene are very correct that nobody actually prays to these entities as if they were hashem, (as per Deuteronomy 4) the real issues and problems already exist and still remain in this formula. That’s my point. If you have a kosher theological construct where you can have hashem, and then you have this special superman type moshiach soul (that sources say metaphorically bears G-d’s name and acts in his authority,) Its as though you have embryonic christology all laid out. All you need is someone to come along and unwittingly misinterpret by being overly literal, and bang…Christianity. I honestly think sometimes that the later Christians actually deified Jesus mainly because they realized that they couldn’t have G-d, and a superman special soul messiah prophet, and still call themselves monotheists in a real sense. It doesn’t strictly matter if you don’t pray to a person if their existence drives your spiritual life. You are praying with your actions, not words in that case. Christianity in embryonic form was clearly born from Judaism. The later Christian theology is all the result of prolonged reflection by later Christian generations. Consider the example I brought of the hasid and the Shinto adherent. I don’t think it’s quite accurate to say the first christians didn’t believe Yeshua is G-d. The Apostles and all early Mashiachim recognized that L-rd Yeshua is G-d descended from Heaven to be temporarily clothed in a body of flesh. When He ascended back to Heaven, Yeshua was transfigured with a new glorified body that was not human flesh. Moses didn’t worship the burning bush, but he did worship the G-d who spoke out of it– in a similar way, all true Mashiachim worship G-d who merely wore the external body of a man for a short time to accomplish redemption of mankind from sins. Kavi… John is the latest of all of the “gospels” – written at the turn of the first century and perhaps well into the second. It’s doubtful it can speak for the “first christians”. Hi Kavi, the word theos in greek is equivalent to the word elohim, it can be for G-d or for a god. For Thomas that has been with Jesus and saw him praying to the father, it is hard to imagine that he was actually speaking to the father in a human flesh. Also, this was not temporary, as all christians know that Jesus has a “glrified” body still today! G-d is invisible and omnipresent, that means G-d does not have a body, or glorified body. If G-d would have a body, he would not be everywhere at all time, because bodies are limited by space and time. Yes and everybody that took Jesus literally (like most Christian do) were sharply rebuked by Jesus. Very truly I tell you, unless you eat the flesh of the Son of Man and drink his blood, you have no life in you. Also, John was not talking of literal even, he took people form other gospels (like Lazarus) and reinvented a story. Kavi, read the Fourth gospel, tales of a Jewish mystic. The matrix has tons of Buddhist, Gnostic, and philosophical themes in it. The blu ray has a ton of commentaries, even one called the Philosopher’s commentary. Very interesting to watch. CR, what are you talking about? Remi was talking about Kavi taking “the red pill or the blue pill,” a reference to the movie The Matrix. I was responding to that. Apostle Thomas was not rebuked by Yeshua when he called Him “L-rd” and “G-d”. If a prophet or a dreamer of dreams arises among you and gives you a sign or a wonder, 2 and the sign or wonder that he tells you comes to pass, and if he says, ‘Let us go after other gods,’ which you have not known, ‘and let us serve them,’ 3 you shall not listen to the words of that prophet or that dreamer of dreams. For the Lord your God is testing you, to know whether you love the Lord your God with all your heart and with all your soul. “Kavi… John is the latest of all of the “gospels” – written at the turn of the first century and perhaps well into the second. It’s doubtful it can speak for the “first christians”. Gene, that’s red-pill talk. Kavi took the blue pill. Everything in the NT is 100% true. If that standard is used, wouldn’t someone also need to criticize the Book of Genesis since Moses wrote of things that happened centuries and even millennia before his time? As for myself, I appreciate and uphold the authenticity of the Torah as written by Moses. Why don’t you accept the book of Mormons Kavi? Revelation 22:19 or Galatian 1:8 would probably be your answer. The same thing for use Deuteronomy 4:2 (Do not add to what I command you and do not subtract from it, but keep the commands of the LORD your God that I give you.) would be one example of verse that say we cannot believe in your new testament. So why don’t you accept the book of Mormon? Jesus clearly added to the commandment by add ONE sacrifice (and nullifying all the other true sacrifices ordained by G-d) that was not in the Torah, and changing the whole law and making it spiritual, even saying that nothing that comes in our mouth defiles the body! What about pork and shrimp? Jesus was not a fulfilment of the law, nowhere it say that a human should be used as a sacrifice and nowhere else than on the temple mount should sacrifices be brought! Why are you so quick to judge the mormon even if you probably never read the whole book, when the new testament actually does the same?